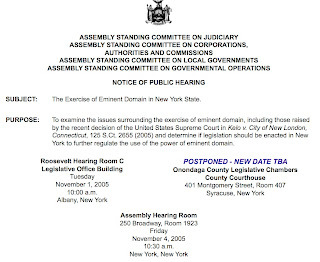 As a hearing on the Atlantic Yards eminent domain case approaches Monday in state appellate court, it’s worth looking back at an 11/4/05 New York State Assembly public hearing on eminent domain, a highly instructive session that received a virtual media blackout. But two other pieces of news were unacknowledged. A St. John’s University law professor, formerly a top lawyer for New York State, cast cold water on governmental attempts to equate Atlantic Yards with other celebrated locations subject to eminent domain. And a staunch defender of eminent domain said the decision to pursue condemnation should be separate from the process of selecting a developer--a sequence that would've nixed Atlantic Yards. “I think eliminating blight such as was done in Times Square by the City of New York was commendable because there the blight really amounted to the danger of crime where people simply didn’t want to go to Times Square,” testified Philip Weinberg, who practiced for twenty years in the New York State Attorney General's Office and was Assistant Attorney General in Charge of the Environmental Protection Bureau. Curiously enough, a lawyer for developer Forest City Ratner, in a court hearing 2/7/07, tried to make the case for eminent domain with the opposite argument. "This is not the crossroads of the world, Times Square, where many developers would like to have an opportunity to build," declared Jeffrey Braun. "I mean, this an extremely derelict stretch." Except the "crossroads of the world" was blighted. And the Atlantic Yards footprint represents one of the last significant pieces of land near Downtown and Brownstone Brooklyn. Weinberg distinguished himself from two advocates who also testified, Scott Bullock of the libertarian Institute for Justice, (IJ) who had litigated the Kelo v. New London case and lost at the Supreme Court 5-4 (but won in the public arena) and John Echeverria of the Georgetown Law and Policy Institute/NRDC, who considered the court’s decision wise. “My take on this is in between those who think that Kelo was an unmitigated disaster and that the world’s going to come to an end, and those who applaud it as merely restating the law,” testified Weinberg, who said that the state Legislature “ought to step up and limit very strictly what those [state] agencies can do” in terms of condemnation for economic development. Weinberg said he’d limit eminent domain to blight, as opposed to economic development, as in Connecticut. 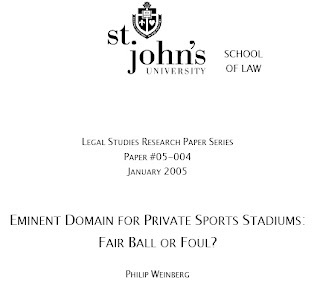 (He wrote a 2005 article saying that eminent domain should not be used for stadiums.) Still, he said the definition had to be tightened. “Now, when you exercise eminent domain to remove blight, when the blight is pollution, when the blight is contamination, when the blight is a high crime incidence, then I think it’s perfectly valid to use it,” he elaborated. “But I share of the concerns expressed by Assemblyman [Richard] Brodsky and others that blight can be misused." “That’s further a concern because of the attitude that the courts have where they will essentially rubber stamp because the test is only whether the agency acted rationally and it’s a very difficult burden for the attackers, assuming they have the funds and the time to hire lawyers and attack these things, to overcome,” he concluded. That’s why it’s such an uphill battle for the plaintiffs in any New York eminent domain case, including Goldstein et al. v. Empire State Development Corporation. In his opening, Brodsky, Chairman of the Committee on Corporations, Authorities and Commissions, acknowledged the ironies created in the wake of Kelo. He gave three examples of how eminent domain has helped New York City: Lincoln Center, Times Square, and Brooklyn’s MetroTech, which was a project of Forest City Ratner. Kelo, he noted, represented eminent domain for economic development without a showing of blight, something not achievable in the city. Still, he allowed that the Eminent Domain Procedure Law (EDPL) wasn’t set in stone, but urged caution, deferring action on pending reform and instead creating, as had been suggested, a temporary commission on eminent domain. Such a commission was also suggested in a report finished in 2007 (and released in 2008) by a New York State Bar Association task force on eminent domain, but has not been appointed. Assemblywoman Helene Weinstein, Chair of the Assembly Judiciary Committee, asked if blight should be more clearly defined. “To start legislating in this area, again, I think is simply going to, therefore, produce lots and lots of litigation,” he said. Cardozo was, predictably enough, against it, and somewhat evasive. He suggest it would not only be "benefiting the property owner to an extent much more than expected, but you are penalizing the taxpayer and I think it is potentially very dangerous." Eminent domain is already costly, from a procedural point of view. The idea of supercompensation is to add another level of caution. What Cardozo left out is the enormous leap in land value when eminent domain is accompanied by a rezoning or, as in the case of Atlantic Yards, a state override of zoning. Later, Brooklyn Assemblyman Green, whose district encompasses the AY footprint, brought up the whether a developer would pay back “the property owner and their heirs," citing the impact on generational wealth. Again, he was leaving out the increase in land value. Assemblyman Robert Sweeney, Chair of the Committee on Local Governments, asked if elected officials were required to sign off on the taking of property. Actually, the community board is only advisory. And none of that applies when the ESDC is the lead agency, as with Atlantic Yards. Later, Weinberg agreed that the approval of elected officials would help, but said it’s no panacea, “because sometimes they’re going to be wrong and procedural safeguards are not sufficient protection.” Rather, he suggested a redefinition of public use. Later, in response to Assemblyman Charles Lavine, the IJ’s Bullock reflected that the blight justification has been around for 50 years. Lavine mused, “It’s American troops returning from Europe after the second World War who viewed blight here in, for example, the City of Detroit and said to themselves, not much difference between portions of the City of Detroit and Dresden. Fair enough? “Okay. That’s the philosophical basis,” Lavine agreed. There are luxury condos in and next to the AY footprint. Green raised the question of stalled projects, “when the state exercises eminent domain for a developer and the developer cancels or fails to complete the development project." He gave an example: “Baruch College in the Atlantic Yards complex [sic] across the street from Atlantic Yards. It was supposed to have been built over 20 years ago. The state executed eminent domain. A number of homes were taken. The project never came into fruition and as a result the state actually created blight. What safeguards should we have?" But that would leave aside the impact on the community at large, Green noted. “And, as we all know, unfortunately government starts on a project and doesn’t finish it for a variety of reasons,” Cardozo followed up. “Market pressures, blah, blah, blah,” Green continued. Can eminent domain be used to take non-blighted properties? 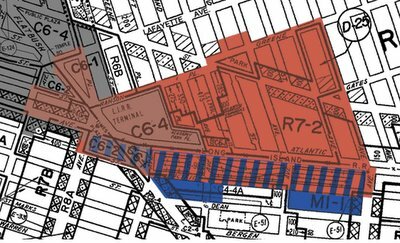 In the case of Atlantic Yards, more than a third of the site would be outside the Atlantic Terminal Urban Renewal Area (ATURA), and most of the condemnation would be in that zone outside ATURA. We now know that the ESDC plans to condemn the entire Atlantic Yards site, including buildings owned by Forest City Ratner, in “friendly condemnations,” which would both clear up title problems and also accelerate the dissolution of rent-stabilized leases held by tenants in FCR-owned buildings. But when Green brought up the issue, without spelling out the reasons, Cardozo was confused. “Executes eminent domain in the footprint, which would include properties that he didn’t purchase and properties that he did purchase,” Green said, without elaboration. “You would only exercise eminent domain on properties where there weren’t building buyers,” Weinstein suggested. “Okay,” said Green, ending the colloquy. Who would be protected? The rent-stabilized tenants. Wylde then gave a case for eminent domain, stressing a legitimate point: eminent domain is needed to control speculation, not people like Susette Kelo who just want to keep their homes but investors who try to make a killing in changing neighborhoods. The people who revived Prospect Heights, however, did that without eminent domain. “[I]f you haven’t spent a career in housing and economic development, it’s hard to come in and understand sort of how this framework of public/private relationships have been put together and how they have served the public good,” she said. Weinstein asked Wylde if she’d recommend changes for localities outside New York City. Well, the Atlantic Yards invitation came from the mayor’s office, not from the City Council. Either she was condemning the ESDC’s Atlantic Yards plan or, more likely, criticizing state authorities that act without a home rule invitation. Wylde suggested that DUMBO would not have come back without the use of eminent domain in downtown Brooklyn. She’s right. And the City Charter may be revised. “Typically, it’s a public or not-for-profit corporation often that is the custodian of the property for decades before there may be private developers that come in to work on it,” Wylde responded. Like Cardozo, Wylde expressed skepticism about supercompensation. Wylde said those projections would have to be updated, and the costs would be passed on to the public. Green suggested that fair compensation should be projected in the developer's proposal. “It will simply take out some of the community benefits you’ve negotiated, some of the affordable housing you’ve negotiated,” Wylde suggested. In other words, she suggested, it was a zero sum game. But affordable housing depends most crucially on government subsidies. Now the best-known plaintiff in the Atlantic Yards case, Daniel Goldstein, had been an AY footprint resident for less than a year before the project was announced, but his opposition is a matter of principle, not profit. He noted that in many cases developers can build around holdouts, citing a book about New York City titled Architectural Holdouts. And if they can’t deal with holdouts, “cities like New York are placed at an enormous disadvantage compared to other communities in revitalizing themselves”—hence NRDC’s concern. Echeverria suggested that reform lay in better process, ensuring that eminent domain “is carried out in the context of a comprehensive community planning effort, which is both public and transparent and considered.” And, as noted above, he suggested that the acquisition of land be separated from the selection of a developer. He proposed an additional requirement of environmental impact statements—which, as those watching Atlantic Yards know, can be lengthy but not necessarily candid. Echeverria suggested a task for the temporary commission: for him (and others) to “nominate the ten best eminent domain projects of the history of New York State” and for Bullock to compile a list of the ten worst. Would AY make the list? Mindy Fullilove, Professor Clinical Psychiatry at Columbia University, and author of Root Shock: How Tearing Up City Neighborhoods Hurts America and What We Can Do About It, has focused on the impact of 1960s urban renewal—not quite the same as the Atlantic Yards project—but reminded legislators how such products can wreck neighborhoods. Fullilove mused, “So, why isn’t the fair market value the future fair market value? So that’s the first issue. But the second issue is that what if you were to add up everything that’s in a neighborhood and compensate the neighborhood for its contents?” She cited as example the loss of jazz clubs in “urban African American ghettos” targeted for urban renewal. Indeed, that’s what a “feasible” relocation plan in the Atlantic Yards case apparently involves, as courts have affirmed. "This project was proposed two years ago by the developer," he said. "It’s the developer driven process, the developer’s idea. It is not an economic development plan. What’s abuse of eminent domain? O’Donnell asked that, had Atlantic Yards reached the City Council, Goldstein’s position would have prevailed. “No. I think the City Council would have voted for this project,” Goldstein said. “But I do think that had it gone through ULURP, the daylight that would have been shed on it would be far greater than what has occurred. Goldstein brought up the malleable definition of blight: “What’s troubling is if you call that area blighted a lot of Roger’s district could be called blighted.